Now that they’re finally living in the same dimension, Peter Parker and Miles Morales have been trying to solve one of the more interesting questions posed at the end of Marvel’s Secret Wars from 2015: Why doesn’t Miles have an Earth-616 counterpart? Though the universes they originally came from were wildly different, there were an immeasurable number of similarities between Peter’s Earth-616 and Miles’ Earth-1610. The trend suggested that a version of Miles could have been walking through the background of Marvel’s comics for years now. When Peter and Miles recently hired Jessica Jones to dig up anything she could on anyone named Miles Morales who resembled the recently transplanted 1610-Miles, she wasn’t able to find a shred of information. 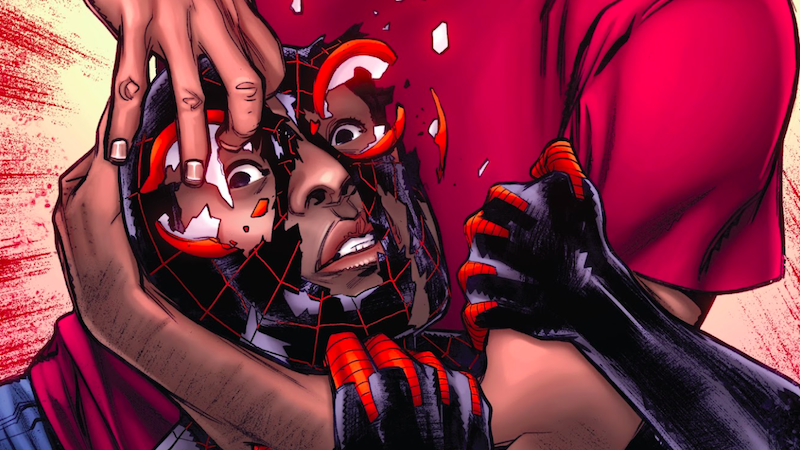 Miles Morales seemed not to exist in the 616 universe. On paper, at least. We know that a man who goes by Miles Morales has been working with the Taskmaster for reasons that aren’t quite clear, but Spider-Men II hasn’t really explained who this guy is or why his word should be taken at face value... until this week. While Miles and Peter have been swinging around the city being spider-buds and apprehending criminals, 616-Miles has been up to some sort of as-yet-unrevealed criminal activity. The exact nature of the shady stuff 616-Miles actually gets into has been unclear, but this week’s Spider-Men II #3 gives a glimpse into his past. More specifically, we see a fateful encounter with a member of Peter Parker’s rogues gallery that sets 616-Miles on a path that would lead to his “disappearance” from the present. Once upon a time, presumably before he and 1610-Miles lived in the same dimension, 616 was an inmate at Ryker’s Island maximum-security prison after taking the fall for his cousin’s involvement with the Rigoletto crime family. Though Miles had willingly chosen to go to prison for his cousin, he’s presented with an opportunity to get out one day when he meets his new cellmate, one Wilson Fisk, who, at this point, is also working for the Rigolettos. Fisk explains to Miles that he’s been sent into the prison to deliver a message that Don Rigoletto is already pulling strings to get them both out of lockup for their service. Miles, appreciative, admits that he’s been paid by another inmate (who Fisk once humiliated) to kill him in his sleep, news that doesn’t exactly shock the future Kingpin. Miles’ willingness to warn Fisk sets the two men on a new path while working for Rigoletto. Soon, they’re sprung free from Ryker’s and continue working for the crime family while also opening a restaurant together as a personal cover of sorts. This wouldn’t be the first time we’ve seen the Kingpin showing off his appreciation for fine dining in typical mobster style, but there’s something decidedly charming to see him and Miles running a “proper” business as partners. As is often the case with mob stories, though, Kingpin and Miles’ partnership inevitably leads to a bit of a power struggle, though this one actually brings the gangsters together. After having worked for the Rigoletto family for years, Miles and Kingpin discover that the don has actually been shortchanging them; rather than trying to negotiate, they decide that it’d be easier to just take over the organization themselves. The don, Fisk explains, has been neglecting to pay his workers a fair mobster’s wage, but because he and Miles can, they work for them now. The Rigoletto don doesn’t believe what he’s hearing, but that’s unimportant because he ends up dead, leaving Miles and Fisk to inherit his entire criminal outfit. While celebrating their new futures, though, Miles informs Kingpin that, as much as their work together has helped him, he wants out of the game for good. The reason? He’s met a woman and he’s ready to start a life with her. In an uncharacteristic moment of benevolence, Fisk understands exactly where Miles is coming from and supports his desire for something new. Instead of threatening Miles’ life for trying to leave the family the way Miles feared Fisk might, he presents him with the ultimate going-away present for a person in their line of work: the complete erasure of any and all files or evidence of Miles having ever existed. As explanations for comic-book weirdness go, there’s a charming rhyme and reason to 616-Miles’ seeming never have have existed when 1610-Miles goes searching for him. It doesn’t only establish that the two Mileses are almost certainly going to be adversaries when they eventually meet, it also suggests that there’s more to 616's relationship with Fisk that we’ve yet to see.